One of the key benefits of Sage CRM is provided by quick and easy access to all data in the system. 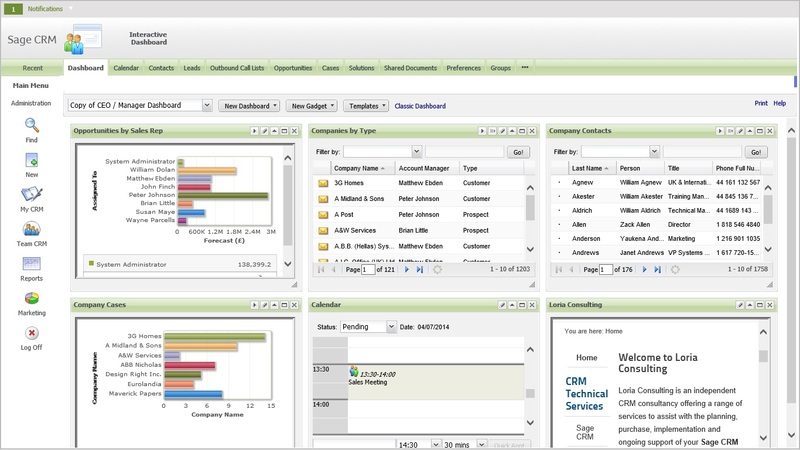 Whether you are looking to do an ad-hoc analysis, or create regular reports to keep you up to speed with the business, Sage CRM reporting tools will provide a user-friendly solution. Dashboards provide a means of creating one or more screens which bring together data from within CRM, external sources such as websites and RSS feeds as well as information from other systems with which CRM is integrated. Dashboards are a great management tool to provide a summary of the key information that they need to keep on top of their job. Users can have access to one or more dashboard views depending on their requirements. Reports are typically output to provide a printed view of information for use in meetings or as part of a larger report. It is possible to create a library of reports for each on the main CRM 'entities' which can be run frequently. The 'run time' parameters can be changed if required, to allow a single report to output data for a range of data options. The built-in report writer provides an intuitive way for users to create their own reports which can be viewed on screen, printed as pdf documents or exported to Excel for further analysis. Please contact us to arrange a demonstration of Sage CRM to see this feature in action.